What is the connection between the aircraft electronics specialist Thales Avionics, a flower bulb and seed company in Carbon-Blanc, and a giant artichoke on a roundabout in Macau? The answer is the gardener Toussaint-Yves Catros. Toussaint-Yves Catros was born in the Breton town of Saint-Brieuc in 1757 and defined himself as a “cultivateur de pépinières” (tree nursery agriculturist), an occupation which had already run in his family for a number of generations. 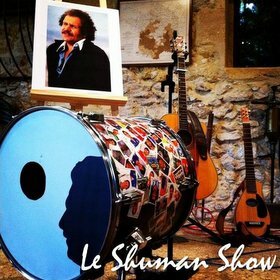 His first big break came when he relocated to Paris and was chosen to oversee the royal tree nurseries in the 8th arrondissement (Faubourg-du-Roule quarter) and in Vincennes. The tall steeple of Saint-Seurin church is one of the most outstanding features of the Médoc village of Lamarque, best-known as the left-bank departure and arrival point of the small ferries that criss-cross the Gironde estuary (the right-bank counterpart being the town of Blaye). The church itself was built over a 40-year period between 1830 and 1870. Its steeple was topped off by a dome which, come 1968, was in a critical state of disrepair. The dome was dismantled and the steeple remained in its decapitated form for a number of years. At the turn of the millennium, the Lamarque village council launched a project to rebuild the dome. Municipal funds were boosted by subsidies from the Gironde département and a grant from the European Union, within the framework of the Leader+ programme aimed at promoting the development of rural areas. Throughout 2003 and 2004, craftsmen from two local companies, the carpenters Pierre-Jean Juste and roofing specialists Fetis, set about delivering a new staircase and dome that would not only complete the church’s silhouette but that would also be a destination in itself, providing visitors with a unique view over the village of Lamarque, the surrounding vineyards (this is Haut-Médoc territory, wine-lovers) and countryside, and out towards the Gironde estuary. The view has to be earned though. To reach the 39-metre-high vantage point, there are 189 wooden steps to climb. 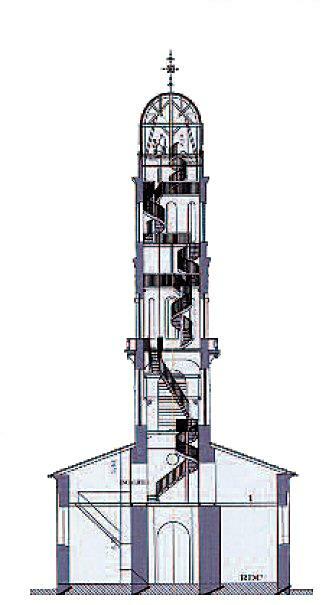 In all, seven landings break up the ascent, and each section of the staircase boasts a different shape and design. According to guide Josette Nonier, the chops and changes in the meandering and winding route of the staircase were inspired by the labyrinth scene which takes place in a library in Umberto Eco’s “The Name of the Rose”. as featured in official leaflet. 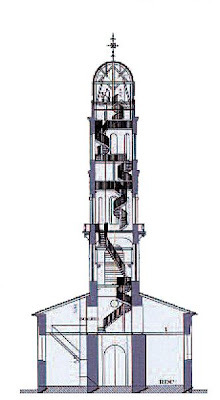 The staircase also passes very close by to the 1-ton church bell, which is rarely in use. However if, like me, you happen to be there on the day a wedding is taking place, you will witness the bell in full flow and, believe you me, it is one loud and powerful beast. Several weeks on, I can still feel the vibrations in my bones. The final destination is the 9-ton lead-plated dome itself, which comprises an observation deck with four oval bull’s eye windows to take in the view, complete with information panels detailing the points of interest that can be spotted. From that vantage point, the only way is down... but gazing back up at the dome from ground level, the dome and its windows no longer look quite the same! > The dome is open to the public 1.30-5.30PM Wednesdays-Sundays, admission costs 2 euros. > Further information on the official Lamarque website, in this introductory leaflet and in this Sud Ouest piece. > The Pierre-Jean Just website includes this picture gallery of the wooden frame of the dome taking shape. 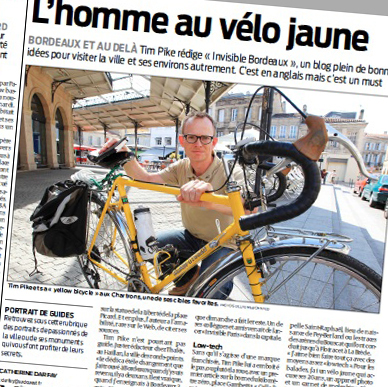 Sud Ouest feature: "The man with the yellow bike"
I am extremely pleased and proud to have been interviewed by Sud Ouest journalist Catherine Darfay. 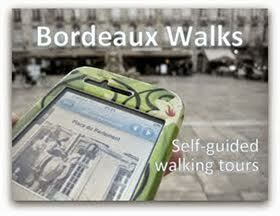 The resulting feature appeared in the August 10th 2012 issue of Sud Ouest (Bordeaux and greater Bordeaux editions). 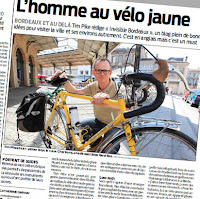 The article serves as a fine introduction to the story and thinking behind Invisible Bordeaux, reveals how I go about producing the pieces... and has gone some way to making my yellow bicycle a celebrity in its own right! Villa Quand-Même et Mépris: contemplating contempt 90 years on! We are in the quiet town of Sainte-Hélène, located mid-way between Bordeaux and Lacanau. Across the road from the water tower, tucked in between the bakers' and the community hall, is a curious, narrow, landlocked house that was built in 1930 by one Mr A. Naturel. In the late 1920s Mr Naturel, a pork-butcher by trade, was looking to purchase a plot of land where he could construct a building that would be both his shop and family residence. He found a spot which was centrally-located in the town but which was far too small for his plans. The seller was keen to push things through and asserted that the neighbours were willing to part with a section of their land, which would have left the buyer with a larger area on which to build. A deal was therefore reached and Mr Naturel purchased the diminutive original plot. However, the neighbours backed out of their promise to sell… or perhaps they never intended to do so in the first place. Naturel filed legal action but to no avail: he was stuck with his tiny plot of land. Naturel was bitter but proceeded to build his house all the same (“quand même”). Not only that, but as a sign of his contempt (“mépris”) for his neighbours, he opted to make his house the most extravagant design ever to squeeze into such a small space. And to sum up his overriding feelings, the villa was given the name “Quand-Même et Mépris”. The reaction of the neighbourhood is undocumented but the façade is a case study in bravura. On either side of the first-floor bow window (which features Mr Naturel’s initials) and below the pictures of vases containing bouquets of yellow and blue flowers are hunting scenes painted on tiles, showing hounds chasing down deer and wild boar. Naturel’s name and trade are spelled out above the ground floor (shop) entrance and window in gold lettering. The surrounding blue, green and orange mosaic pattern is repeated below the window. What may or may not be a lightning rod adds a little more height to the building which is so short on width and depth! The building is now solely a private home and no longer a shop, but the 1930 design remains… and presumably today’s occupiers are happy to make do with the square opposite the house when they need to stretch their legs! > Further photos on dedicated "Petit Patrimoine" page, the content of which largely served as the basis for this item. Thanks to Élisa for the detailed instructions that enabled me to find the villa! The small triangular Place Picard in the Chartrons district is home to one of the world’s many replicas of the Statue of Liberty. The recently-restored resin model which can be seen today has been in position since 2000, but the presence of the statue on the square goes back much further. Of course, the marginally better-known full-size version of the statue in New York (full name: “La Liberté éclairant le monde” or “Liberty Enlightening the World”) was executed to the designs of the French sculptor Frédéric-Auguste Bartholdi (1834-1904) and given by France to the United States in 1886 as a memorial to America’s independence.